This time it contains the first 12 episodes rather than 10, from the original 1973 TV series. This sets things up nicely for an eventual set of five discs to cover the full 60 episodes, so make sure you support this release even if you’ve already got the 2004 version! 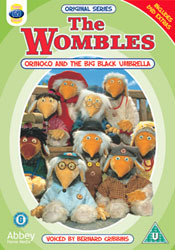 The DVD has two ‘interactive extras’ – Meet The Wombles, with profiles of Great Uncle Bulgaria, Orinoco and Tomsk, and an eight-question trivia quiz, Bungo’s Brain-Teasers.